Today's slang word of the day is futz around. Its definitions appear below. Click here to vote on usage and vulgarity, to see words that share the same meaning, and to see words that share the same root words. Citation from "A Spy in the House of Love", Dollhouse (TV, 2009), Season 1 Episode 9 blacked out to resolve Google's penalty against this site. Last edited on Oct 17 2010. Submitted by Walter Rader (Editor) from Sacramento, CA, USA on Aug 17 2009. Today's slang word of the day is filly. Its definitions appear below. Click here to vote on usage and vulgarity, to see words that share the same meaning, and to see words that share the same root words. Today's slang word of the day is get up out of. Its definitions appear below. Click here to vote on usage and vulgarity, to see words that share the same meaning, and to see words that share the same root words. Citation from "Chapter 5", Eastbound & Down (TV), Season 1 Episode 5 (2009) blacked out to resolve Google's penalty against this site. Today's slang word of the day is five-dollar word. Its definitions appear below. Click here to vote on usage and vulgarity, to see words that share the same meaning, and to see words that share the same root words. Citation from often attributed to Mark Twain blacked out to resolve Google's penalty against this site. Last edited on Apr 25 2013. Submitted by Walter Rader (Editor) from Sacramento, CA, USA on Sep 21 2009. Today's slang word of the day is good people. Its definitions appear below. Click here to vote on usage and vulgarity, to see words that share the same meaning, and to see words that share the same root words. Citation from "Smoked", Lie To Me (TV, 2010), Season 3 Episode 8 blacked out to resolve Google's penalty against this site. Today's slang word of the day is donkey-faced. Its definitions appear below. Click here to vote on usage and vulgarity, to see words that share the same meaning, and to see words that share the same root words. Citation from "Doubt", Wilfred (US TV), Season 1 Episode 11 (2011) blacked out to resolve Google's penalty against this site. Today's slang word of the day is blue marble. Its definitions appear below. Click here to vote on usage and vulgarity, to see words that share the same meaning, and to see words that share the same root words. Citation from "The Best Christmas Story Never Told", American Dad! (TV), Season 2 Episode 9 (2006) blacked out to resolve Google's penalty against this site. Today's slang word of the day is driveway story. Its definitions appear below. Click here to vote on usage and vulgarity, to see words that share the same meaning, and to see words that share the same root words. Citation from "Tell Us Your Listening Story", Minnesota Public Radio, Carmen Middleton blacked out to resolve Google's penalty against this site. Man, that was the most pointless drive-way story of my life. Last edited on Apr 17 2013. Submitted by Walter Rader (Editor) from Sacramento, CA, USA on Feb 06 2010. Today's slang word of the day is booger sugar. Its definitions appear below. Click here to vote on usage and vulgarity, to see words that share the same meaning, and to see words that share the same root words. Citation from "Chapter 9", Eastbound & Down (TV), Season 2 Episode 3 (2010) blacked out to resolve Google's penalty against this site. Today's slang word of the day is go to ground. Its definitions appear below. Click here to vote on usage and vulgarity, to see words that share the same meaning, and to see words that share the same root words. Citation from "Good Advices", Covert Affairs (TV), Season 2 Episode 2 (2011) blacked out to resolve Google's penalty against this site. Today's slang word of the day is desk monkey. Its definitions appear below. Click here to vote on usage and vulgarity, to see words that share the same meaning, and to see words that share the same root words. a person who has a menial job and who works at a desk. Citation from "Happiness", Wilfred (TV), Season 1 Episode 1 (2011) blacked out to resolve Google's penalty against this site. Today we hit 5,300 citations! As of early this morning, The Online Slang Dictionary reached a milestone: we now have more than 5,300 citations of slang use from published sources such as films, magazines, books, and TV programs. The last time I counted, there were only 4,800! It's a bittersweet occasion, though, since today is also coincidentally the 400th day of Google's penalty against the site for showing those citations. Since Google has been unwilling to have a dialogue with me about the penalty, the site has been blacked out both as an act of protest and as an attempt to publicize the issue. I just don't know what else to do. If you find The Online Slang Dictionary useful, please help me in spreading the word. I really want to be able to show citations on the site, since they are a necessary component of a high-quality dictionary. Let's get Google's attention and get this fixed! Details about the penalty appear below. Thanks and have a great day. P.S. What follows is information about the penalty. It's also available on the slang dictionary's website here. This site has more than 5,300 citations of slang use gathered from published sources, but we can't show them to you. Google penalizes this site in search rankings when we do. And even though all of the citations were removed days ago, the penalty is still in place because we used to show citations. This is a bug in Google's code that applies the "Panda" penalty. Though Google has confirmed the penalty, they have been unwilling to enter into a dialogue with me about resolving it. The site has been blacked out to mark the 400th day of the penalty. I hope this will call attention to the bug. I just don't know what else to do. Please help me in spreading the word. If you've found The Online Slang Dictionary to be useful, please let your friends and colleagues know about the site. If you work for Google, I'd love to talk with you. I can be reached via email at waltergr@gmail.com. Why are citations important for a slang dictionary? Real dictionaries have citations because that's how they show that their definitions are real. Being a dictionary of real slang terms, the same applies to us. Citations serve the same purpose in dictionaries as they do on Wikipedia: they provide evidence for factual claims. Do you have evidence of the penalty? Yes. A Google employee confirmed that this site is being penalized. 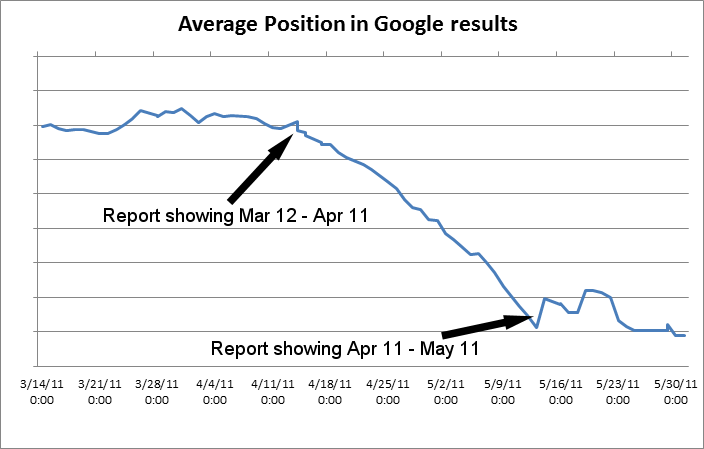 The following shows the consequence of this penalty, measured in visits to this site from Google searches. The rest of this page explains the data in more detail. Started in 1996, The Online Slang Dictionary is the oldest slang dictionary on the web. Serving 1.9 million visitors each month, it provides more than 24,000 real definitions for over 16,000 slang words and phrases. The integrated slang thesaurus has more than 600 categories of meaning. Unique features include usage voting, vulgarity voting, and SlangMaps. Logged in users can add words and definitions. The site has approximately 5,300 citations gathered by hand from TV programs, films, news publications, magazines and other sources - and added by hand to the appropriate definitions. Each is a short 1 - 3 sentence excerpt, with proper attribution. An additional 5,700 citations are prepared and ready to be added to the site. Another set of around the same size has been logged but not yet prepared. Adding those two sets would bring the citation count to more than 16,500. But since Google penalizes the site for showing citations, there is no reason to add them since they wouldn't be available to visitors. October 9: Google resumes the penalty. November 16 - present: The penalty continues unabated. On November 16, in order to be able to compete with dictionary websites that don't have citations, I once again removed all citations. Hopefully this will cause the penalty to be lifted. In the meantime, the penalty is ongoing, and is decimating traffic to The Online Slang Dictionary. I'd love to hear them. My email address is waltergr@gmail.com. Today's slang word of the day is idiot box. Its definitions appear below. Click here to vote on usage and vulgarity, to see words that share the same meaning, and to see words that share the same root words. Citation from "I Never Met the Dead Man", Family Guy (TV), Season 1 Episode 2 (1999) blacked out to resolve Google's penalty against this site. Today's slang word of the day is bread and butter. Its definitions appear below. Click here to vote on usage and vulgarity, to see words that share the same meaning, and to see words that share the same root words. the main source of income for a business. Software is our bread and butter. Citation from "Pilot", American Dad (TV), Season 1 Episode 1 (2005) blacked out to resolve Google's penalty against this site. Last edited on Nov 03 2011. Submitted by Jeff K. from Reno, NV, USA on Sep 01 2002. Today's slang word of the day is -ville. Its definitions appear below. Click here to vote on usage and vulgarity, to see words that share the same meaning, and to see words that share the same root words. suffix used to turn most any noun into a metaphorical place. Citation from "The Fight", Parks and Recreation (TV), Season 3 Episode 13 (2011) blacked out to resolve Google's penalty against this site. Last edited on Aug 01 2011. Submitted by Walter Rader (Editor) from Sacramento, CA, USA on Aug 31 2009. Today's slang word of the day is a lot on (one's) plate. Its definitions appear below. Click here to vote on usage and vulgarity, to see words that share the same meaning, and to see words that share the same root words. Citation from "The Hand That Rocks the Wheelchair", Family Guy (TV), Season 9 Episode 12 (2011) blacked out to resolve Google's penalty against this site. Citation from "Mr. Bob's Toddler Kaleidoscope", Up All Night (TV), Season 1 Episode 5 (2011) blacked out to resolve Google's penalty against this site. Today's slang word of the day is blech. Its definitions appear below. Click here to vote on usage and vulgarity, to see words that share the same meaning, and to see words that share the same root words. Citation from "Winner of the evolutionary etiquette ticket giveaway", Boston Globe - Miss Conduct's blog, Robin Abrahams, March 19 2010 blacked out to resolve Google's penalty against this site. Today's slang word of the day is doc. Its definitions appear below. Click here to vote on usage and vulgarity, to see words that share the same meaning, and to see words that share the same root words. Citation from "Begin the Begin", Covert Affairs (TV), Season 2 Episode 1 (2011) blacked out to resolve Google's penalty against this site. Today's slang word of the day is bad seed. Its definitions appear below. Click here to vote on usage and vulgarity, to see words that share the same meaning, and to see words that share the same root words. a poorly-behaved or immoral person, especially amongst good people. Citation from "Welcome to the 'Club'", The New York Times, Charles M. Blow, July 24, 2009 blacked out to resolve Google's penalty against this site.